Preheat the oven to bake at 400 degrees and use an insulated baking sheet; mine are old so I brushed it lightly with PAM. Blend Dry ingredients and sift through a mesh strainer into a mixing bowl. Cut in ¼ pound very cold butter, I cut into pieces and blended with a pastry cutter. Add ¾ cup cold ½ + ½, mix until blended. Flour a pastry board, dump the dough out and gently turn dough until all sides are covered with flour. Pat into about 1 inch thickness and cut with floured cutter, collecting the scraps to make additional biscuits. Place on baking sheet and bake for 12-15 minutes. Mine took 17 minutes. Cool on a rack, slice in half, and cover with strawberries and fresh whipped cream. 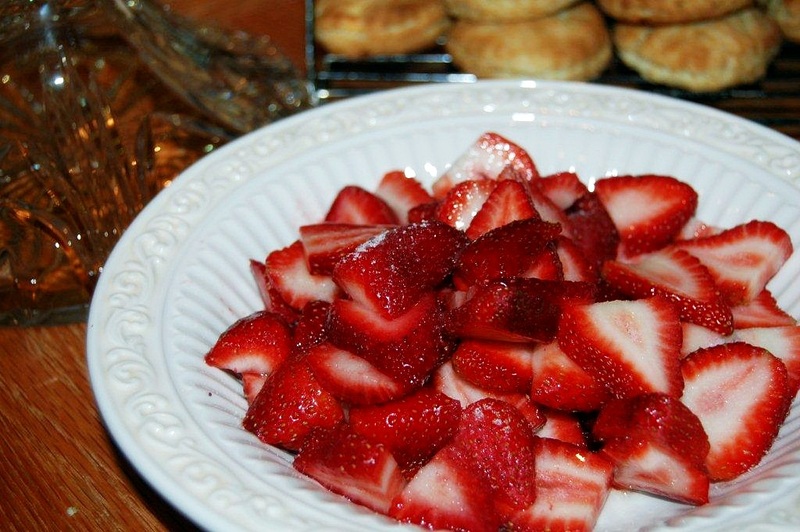 Brandied Strawberries-definitely the best part of the dessert and unsweetened whipped cream. Clean and dry berries remove core and leaves, slice, sprinkle with a little sugar if needed and add several splashes of brandy. Mix, cover and refrigerate, toss the berries in their boozy juices often.